Trophies from Grand Awards help to celebrate all kinds of achievements from sporting events to chili cook-offs to academic contests. If you’ve got a winner or you want to make someone feel like a winner, we can make a trophy just for you. Our trophies are assembled to fit your specific needs, so there’s no such thing as “stock” or “generic” trophy with us. 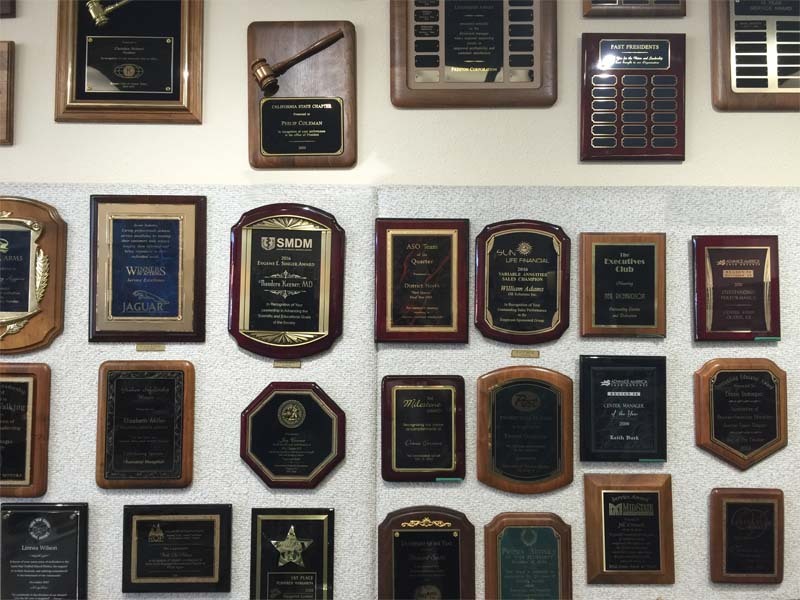 Plaques are a great way to show appreciation and celebrate success – whether personal achievement or a corporate event. We can do acrylic, crystal, wood and metal engraving as well as sandblasting to make your plaque truly outstanding and displayed with pride for years to come. We can also create and update perpetual plaques. Engraved and personalized gifts are a wonderful present to give to those special to you. Perfect for Bridesmaids and Groomsmen, Birthdays, Births, Graduations, Weddings and more. We have a selection of items from keychains and jewelry boxes for personalization or bring in your own item to be engraved. 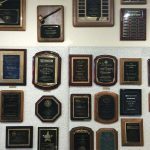 Offering both Rotary and Laser Engraving capability, when it comes to creating something with your information it then Grand Awards is the place to go. We can engrave most anything from acrylic boxes, tables, and plaques, leather items, cutting boards, plates and more — even swords! Yup, we engrave swords. Name tags, desk signs, door sliders and more, Grand Awards works with your business and organization to create just what you’re looking for. Grand Awards has been serving the Central Coast for over 35 years. In that time, we’ve made thousands of signs for desks, doors, walls and more. We added banners to our list of offered items many years ago, and have been growing our sign capability ever since. We know you’ve seen our work around town! Take a look at our SignStar website to see our customer gallery as well as our full product selection, or scroll down to see a tiny sampling of the variety we offer. Whether full color printed vinyl, dye sublimation or embroidery, Grand Awards has you covered. Like our signs and banners, our garment decorator is a new offering to the lineup. See the page for more information or take a look at the DW Embroidery website for more information. Need help with your design? We have an in-house art department that can help you. From logo design to custom awards and everything in between.